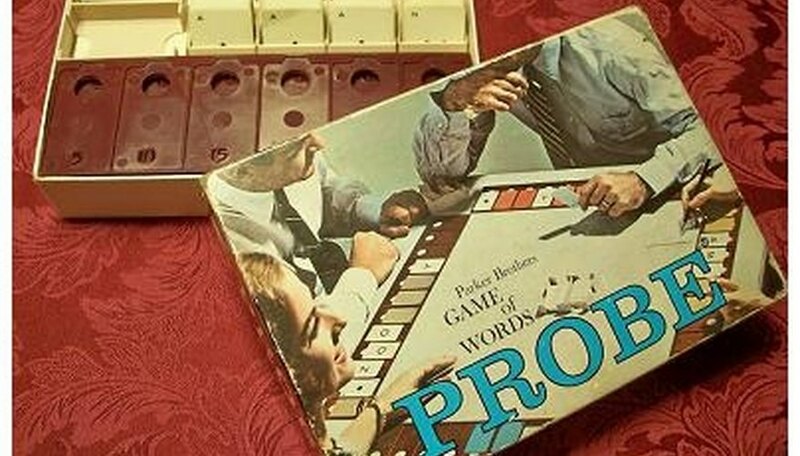 Probe is a word game by Parker Brothers that was first released in 1964. The game is similar to Hangman, except Probe has some interesting twists. For two to four players, Probe has a scoring system and strategies in letter placement and guessing. The suggested age range is 10 and up. The Probe game box contains four plastic word trays, four sets of letter cards and a deck of activity cards. Have a dictionary handy, and paper and pencil for score keeping. The activity cards contain instructions such as "Add 20 to Your Score" or "Triple the Value of Your First Guess". They add an element of chance to the game, and can make or break a close game. One player is the scorekeeper. Each player thinks of a word and selects the letter cards to spell the word, placing them in his tray face down without the other players seeing the letters. The letter cards contain special cards known as "blanks," which can be strategically placed at the beginning or end of the word to confuse opponents. When everyone has arranged a word in his tray, the game begins. The first player draws from the activity card stack, which has been shuffled and placed face down, and follows the instructions on the card. He then asks any other player to expose a specific letter. If the other player has the letter in his word, he must turn over the letter card. If he has more than one of the same letter, he chooses which one he wants to expose. The first player's turn ends when he unsuccessfully requests a letter. During a turn, the player can ask for any letters, one at a time, from more than one other player. When a card is exposed, the asking player gets the points from the exposed letter. The point value is in the letter tray under each letter space. During his turn, if the asker knows another player's word, he asks one letter at a time in any order until all are exposed. The asker gets a bonus of 50 points for solving a word, and his turn continues until he does not guess correctly. If a player thinks he knows another player's word and it is not his turn, he can use the Interruptive Rule, which allows him to interrupt the game and identify each letter and blank in correct sequence; there must be five or more unexposed cards. The bonus for solving with the Interruptive Rule is 100 points; the penalty if incorrect is -50. Using blanks: Blanks are effective when used with words that might or might not have a prefix or suffix or for plurals. Activity cards can direct players to expose a card, and by having a blank to expose, a player can keep key letters hidden. Choosing words: Words with unusual letter combinations and that use the less common letters can be challenging. Words in which the same letter appears more than once give the player a strategic advantage in deciding which to expose. Vocabulary level: Players can modify the play to accommodate younger players or those with lesser vocabulary skills. Some players with similar vocabulary levels might omit the activity deck so the game play will focus on skill rather than luck. Memory: Keeping a written list of letters that have been requested is not allowed; a good memory is an asset.